Prison literature has a long and rich history, stretching back to Jack London, Nelson Algren and Malcolm X. 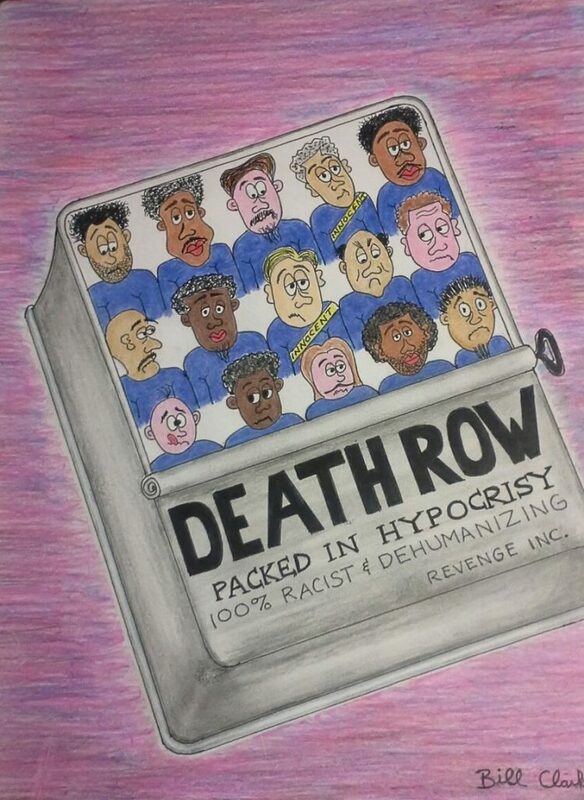 The genre includes powerful work from prisoners incarcerated on death row, which is often surfaced with the help of activists or artists in the outside world. 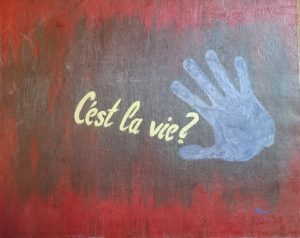 The latest of these projects, “San Quentin Artists,” publishes art and poetry made by death row inmates at San Quentin State, California’s oldest prison and the only one in the state with death row inmates. Nearly 750 people are currently on death row at the facility, which has a gas chamber, though no prisoner has been executed there since 2006. A recent measure upheld by the California Supreme Court, however, could allow executions to resume. Among the prison poets White publishes is Bill Clark, who began writing poetry after he arrived on death row in 1998. Clark, who was convicted the year before of a double murder involving a computer store robbery, maintains his innocence. For him, poetry is both therapeutic and instructive. “Hypocrisy,” a cartoon by inmate Bill Clark meant to satirize the racism he sees in police lineups. Another prison poet White publishes is Steve Champion, also known as Adisa Kamara, who first got Clark into writing poetry. Champion, a former Crips gang member who was convicted of two counts of murder after a home burglary, is today a well-known prison rights advocate who went on hunger strike in 2012 over the treatment of prisoners at San Quentin. This was a point White stressed when talking about the work San Quentin’s inmates produce, arguing that many people who were on death row are no longer the same person they were when they came in. “Steve Champion has been in since 1981. He’s since gone on a journey to transform himself form a thug to an enlightened person with a genuine lesson to share. If he were to be executed next month would the world be a safer place? Certainly not,” she said. Among the lessons Champion wants to share is what he sees as the racist underpinnings of America’s prison system. Champion’s poem, “Transported to Another Time,” was inspired by one of his evidentiary hearings, where he said he saw the vastly different outcomes for people who had resources, access and money, and those who didn’t. The hearing also called to mind for him images of the slave trade because he was put into heavy shackles. Read Champion’s poem, “Transported to Another Time” below or listen to him read it aloud here. I’m seated on the auction block of the courtroom. I’m transported to another time when men hunted men, cruelly enslaving them. Not as prisoners of war but for profits. Every morning the sun rises I chant an African battle hymn. Every evening the sun sets I chant a freedom song. County jail buses are vessels containing black, brown and white bodies. I am transported to another time where slave ships have morphed into slave buses. Where slave fort is the new prison fort. are updated to tasers, pepper sprays and stun guns. Commanded by men and women who wear green, the color of money, the color of greed. I’m transported to another time when I’m poked and prodded. Flanked by armed guards. Misdirected and directed to kneel, to be still. Read more writing and see more art by inmates at San Quentin here, here, here and here. San Quentin also has an official arts in corrections program, which you can read about here. And a new podcast called “Ear Hustle” is made inside the walls of San Quentin; listen to that here. Nicola White is a London-based artist who has been working with inmates since 2015. Her other artwork is made from objects she finds while mudlarking along the banks of the River Thames. More of her work can be seen at www.tidelineart.com. More of Steve Champion’s poetry can be read here.